The knight with a sword! *^^* Sorry 'bout that blue... I really like it^"
Nice effects in the bg, would of been better with another font, but it's still good. Very nice, the backround feels nice and strong to match the image of the firl, good job. Excellent background. Really works into the image.Fantastic..going as one of my faves. I like the words, and the girl character in it too. She do show bravery, but i think it does not fully show the word 'never give up'. The background just moderate. 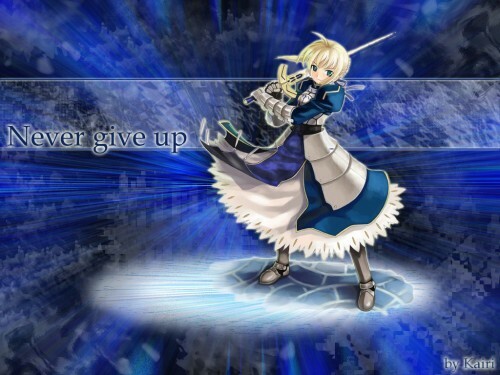 However, it's considerate a good wallpaper because of the word never give up, haha. Background looks like a vortex, everything is sinking toward a middle point. Also it looks very futuristic. The little girl has nice textures and nice colours.